Offshore wind can rebalance UK economy by bringing wealth to the North, major conference told. The progress in the Humber offshore wind sector over the last five years is remarkable. That’s the message that came across loud and clear at Team Humber Marine Alliance's Offshore Wind Connections 2017 at the beginning of May. A line-up of star speakers commented on the fast pace of change in the Humber and the attention the region is gaining as other countries watch and learn. Lord Haskins, Humber LEP chair, told a packed hall at Bridlington Spa that the renaissance in the Humber was also psychological. “Confidence breeds confidence,” he said, adding that offshore wind could increase the region's competitiveness and take it ahead of the world in terms of energy supply. He said it would help to rebalance the UK economy over the next 10 years, bringing wealth to the North. The work brought Mr McNeal to the Humber and he recalled small cranes taking their first tentative steps. “Looking back now, it’s worth pausing as we must reflect on what has been achieved and how far we have come in a short space of time. Very few people thought it would be possible. He said that in the future the conversation would be more in terms of a global market outside the UK and Europe. “We want more business as offshore wind goes global,” he said. Paul Vigeant of New Bedford Wind Energy, Massachusetts, who attended as part of 24-strong American delegation, said: “New Bedford aspires to be like the Humber. Cost reduction was the focus of a speech from Ray Thompson, head of business development at Siemens Gamesa Renewable Energy. He said: “I am convinced offshore wind projects of a significant size and scale are the cheapest way to generate electricity. We have turned the world upside down. We were seen as expensive technology. That’s going to change. Businesses and politicians from the USA, Denmark, Germany, Sweden and Switzerland were among 400 delegates that gathered for OWC 2017 to discuss the huge opportunities in the industry. Team Humber secured DONG Energy as its diamond sponsor, along with a number of influential speakers, for the conference and exhibition, held on May 3 and 4.. It gained support from around the estuary with Triton Knoll and East Riding of Yorkshire Council as platinum sponsors. The University of Hull’s Project Aura, DeepOcean and Mapa PR were gold sponsors and CWind, Mullion, Myton Law and JBA Consulting were silver sponsors. Greenport Hull supported the event and Renewable UK, NOF Energy, SubseaUK and Grimsby Renewables Partnership were partners. Klaus Skoust Møller, senior programme director at DONG, said ahead of OWC 2017: "It will showcase the Humber’s position as a leader in renewable energy. We are proud to be part of the significant growth in the area. “We are absolutely committed to our operations in the Humber and plan to invest £6bn in the region by 2019." Mr Møller added that Race Bank Offshore Wind Farm off the North Norfolk coast, for which DONG is using its Grimsby Fish Docks construction base, would be capable of powering more than half a million UK homes when it becomes operational in 2018. 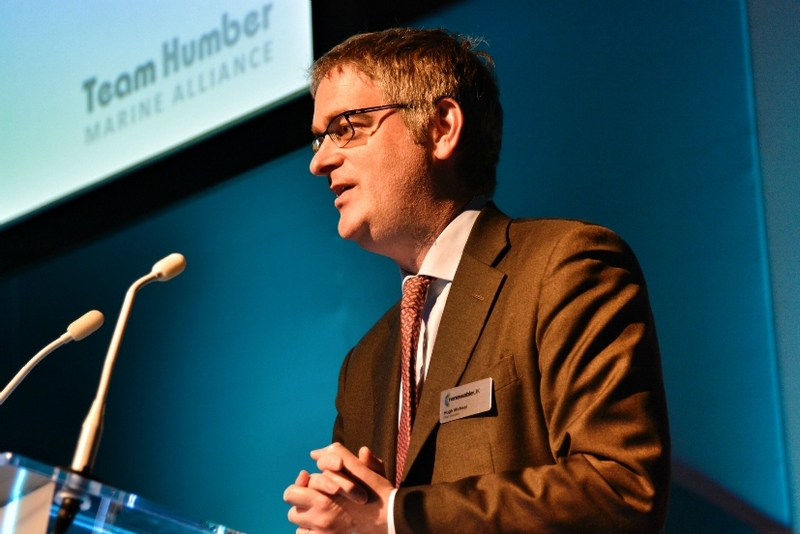 Mark O'Reilly, Team Humber Marine Alliance CEO and chairman, said OWC17 highlighted the Humber's preeminent position in the green energy revolution in the UK and Europe while also looking at global prospects for the region's manufacturers and providers of specialist skills. The conference welcomed wind farm developers, owners, industry trade bodies and companies along the length of the offshore wind supply chain. Delegates from New Bedford, Massachusetts, and Offshoreenergy.dk, which have memoranda of understanding with Team Humber for future collaboration, were present, with a strategic partnership agreement signed between New Bedford and Team Humber on the eve of the event and a sister city agreement signed between New Bedford and Grimsby the previous day. Offshoreenergy.dk pointed to 7500MW of offshore farms being built on the eastern side of the UK in the next five years. Mr O'Reillly added: "Billions are being pumped into the North Sea industry. The Humber is its epicentre and the opportunities for businesses in the supply chain are vast. "Three of the UK’s largest wind farms and 80 per cent of all North Sea offshore wind farms are on our doorstep while 60 per cent of the entire European offshore wind project to be built by 2020 is within 12 hours' vessel steaming time." The delegation from New Bedford has been the largest in a series of inward and outward missions organised by Team Humber to strengthen the region’s links with the USA. Mr O’Reilly said that the aim was to highlight the Humber Energy Estuary as a global centre of excellence for offshore wind, and renewables generally, with skills and experience being transferable to the US. This February the Humber welcomed the second top-level American party to visit the Humber wanting to learn about the North Sea wind industry. The nine-strong US government delegation visited Siemens, Greenport, the University of Hull, Humber UTC, CATCH, Dong Energy and EON Humber Gateway. West Coast states Washington, Oregon and California and the state of Hawaii were represented, alongside the eastern seaboard states that formed a delegation in September 2016.